There's something wonderful about a lazy weekend breakfast. It’s a chance to spoil yourself just a little bit, and as it’s the weekend, a mimosa or two with brunch is almost mandatory. Make an event of your brunch and invite some friends over to enjoy it with. On a dual fuel range cooker you'll have plenty of space to create the perfect brunch for a big group of friends or family. There's a whole host of delicious brunch recipes out there, both savoury and sweet and for this cheats guide, we've chosen the most iconic brunch recipe, eggs benedict. One of the most delicious ways to enjoy eggs, the recipe can be easily adapted to suit all tastes and dietary requirements. Eggs:As the name suggests, the main component of this dish is eggs, two per person should be enough. Muffins: English muffins are light and fluffy, they create the perfect base for this dish. White or wholemeal, depending on your preference. Smoked ham:You can use whichever type of ham is your favourite, but why not try a few slices from the deli counter to make the most of your brunch? Opt for a thick-sliced ham with a mustard crumb for a little added something. For vegetarians & pescetarians:Swap the ham for sautéed spinach or a grilled Portobello mushroom to create a veggie-friendly version. For those pescetarians, add an indulgent touch to your brunch and replace the ham with smoked salmon. Hollandaise sauce:This sauce ties the whole dish together. It can be tempting to buy the store-bought variety for ease, but making it from scratch isn’t difficult, and the result is worth it. You’ll need: 100g unsalted butter, 2 large free-range egg yolks, 1tbsp lemon juice, 1tsp Dijon mustard and a splash of white wine vinegar. First, make the hollandaise sauce. Begin by melting the butter, in a small pan, over a low heat on the hob. Then, over a gently simmering bain-marie, whisk the egg yolks together with the lemon juice and the mustard. Continue to whisk constantly and very slowly add the melted butter, if you add it too fast, the mixture will split. If your sauce is too thick, add a tablespoon of water to loosen it up. Finally, add a splash of white wine vinegar and season to taste with salt and pepper. Remove from the heat and keep warm until serving. Next place the muffins in the oven and while they are warming up, poach the eggs. 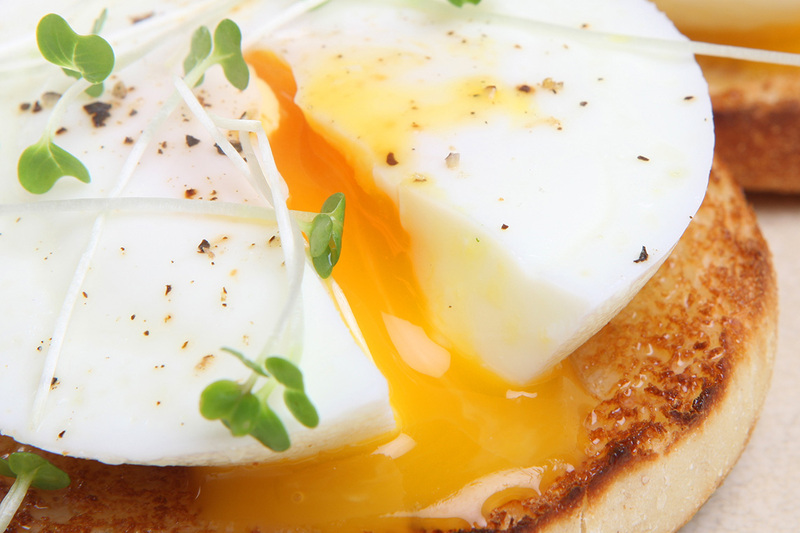 There’s an easy trick to making perfect poached eggs. Simply oil a piece of strong cling film, spray on oil is easiest for this, and oil a teacup. Put the cling film into the teacup, with a generous amount hanging over the edges and crack the egg into it. Then tie the top of the cling film to create a pouch. You can even crack two eggs into each cup to create double yolk eggs, or add pepper, Tabasco or other oils and spices for extra flavour. Then poach the pouches in a pan of simmering water for around four minutes, or until cooked to your liking. Split the warm muffins in half, layer on some smoked ham, follow with the poached eggs and finally, drizzle of a few spoonfuls of homemade hollandaise sauce. 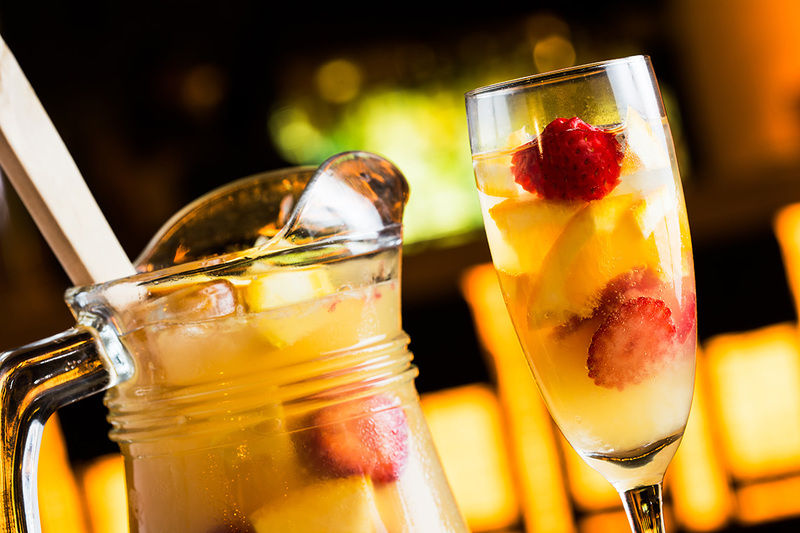 And finally, to get the most out of your weekend brunch, you’ll need Mimosas. 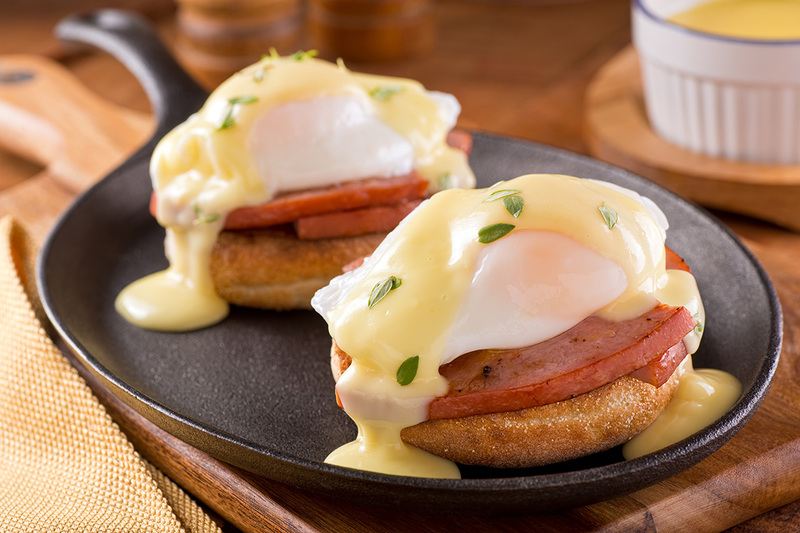 Refreshing and indulgent, a mimosa works perfectly with eggs benedict. Make a Mimosa using equal parts champagne (this can be substituted for prosecco or cava, depending on personal tastes) and citrus fruit juice, usually orange juice, and serve in a champagne flute. What better way to enjoy your weekend? Bon appetite!